Even if the fall season is knocking on our doorsteps, it’s still hot and humid in multiple regions in Canada! I don’t know about you guys, but when I saw this deal to get a second blizzard at Dairy Queen for only $0.99, I had to resist the urge to run to my nearest store. I’m a huge chocoholic, and this tasty treat is my go-to guilty pleasure. 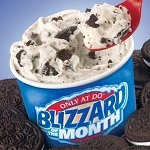 When you buy one blizzard, you’ll get another at lesser or of equal value for $0.99, no coupon or magic word required. Treat yourself or a friend to a scrumptious treat that melt in your mouth. Grab two of your favourite flavor or try something new; like the Banana Cream pie one or the Choco cherry love blizzard. I’m a huge fan of the Reese’s Peanut Butter Cups one, so I might just pick up two of those myself!